We’d love your help. Let us know what’s wrong with this preview of A Wedding on Lily Pond Lane by Emily Harvale. A gorgeously uplifting, romantic and heartwarming read. Every bride wants the perfect wedding and Mia Ward is no exception. But she is the only bride in Little Pondale and everyone in the village has ideas for her Big Day. Drowning in suggestions, Mia needs some help. A gorgeously uplifting, romantic and heartwarming read. To ask other readers questions about A Wedding on Lily Pond Lane, please sign up. Whoo hoo it's Wedding Time in Little Pondale! Oh is so exciting to be back, and this time round celebrating Mia and Jet's big day! Who doesn't love a good wedding. Don't worry it definitely has all the lil dramas, mayhem, excitement, fun, witty moments, you come to expect from a wedding. Ok so I'm definitely not going to risk giving anything away with this one!! This time round being part of the wh 5☆ Simply Superb!! This time round being part of the whole wedding from start to finish was pretty special. I've been on a journey with Mia and Jet and to be part of their wedding was the icing on the cake! Every time I visit Little Pondale I never want to leave. The Characters have become friends, I love being privy to all the village gossip. It's with a heavy heart I close the book on the final instalment, but ever hopeful there might one day be more! As always Emily has written another superb Gem. It's full of warmth, romance, charm, humour, drama, mayhem, wit, friendships, entertaining lil twists and plots, fantastic endearing characters. The perfect mix for the perfect ending. Did I mention how much I Adore this series and Emily Harvale! If you haven't yet had the pleasure of reading this Superb Magical Series then I can't urge you enough to pick up a copy! Ella tutted. ‘He’ll never change. Almost five months living with me and I still haven’t knocked the ‘posh’ out of him.’ She raised her eyes skyward and laughed. This village is a hotbed of lust, you know. If you’re looking for a man, this is the place to be. Don’t let Garrick see that expression on your face… He won’t let you see Flora if you’ve got a face like a sad sausage. The writing is witty and crisp. The characters are charismatic, quirky, and lovable. And the plot is a wonderful blend of drama, emotion, hilarious mishaps, banter, unconditional fri Light, amusing, and addictive! I was deliriously happy to be hack in Little Pondale along with Mia, Jet and everyone else. It feels like only yesterday that I read Return to Lily Pond Lane, so it was much easier for me to pick up the story than it had for me in previous installments. This book picks up pretty much where the previous one finishes, so I reckon its best to read these two as a pair, but they are both wonderful, and quick and easy to read, so it really wouldn't be any hardship. This was so amusing, romantic, and a I was deliriously happy to be hack in Little Pondale along with Mia, Jet and everyone else. It feels like only yesterday that I read Return to Lily Pond Lane, so it was much easier for me to pick up the story than it had for me in previous installments. This was so amusing, romantic, and also just proves at a magical place Little Pondale is to live in. It was lovely getting to know Breanna, and there is plenty going on to keep the village gossips happy. It's hard to know what to share with you, as the book is really quick to read, a sheer pleasure, a bit of a whirlwind, but with assorted sub plots. There are even some lovely surprises to look forward to. I loved every moment I spent hoping that the wedding would go smoothly, and that Mia and Jet would be happily married by the end of it. Of course that doesn't mean that is the only romance, and there are some lovely interactions between some of the other villagers too. All in all another triumph of a book in this very popular series. Who doesn’t love a wedding? I found myself tearing up quite a few times as the planning of Mia and Jet’s wedding gets underway. Opening one of this authors books is like coming back home. There is just something so comforting about them. I just want to transport myself into them and live there and spend even more time with the characters. Breanna is a new character and an old school friend of Mia’s. I really enjoyed getting to know her better and see what Little Pondale has in store for her and it Who doesn’t love a wedding? I found myself tearing up quite a few times as the planning of Mia and Jet’s wedding gets underway. Breanna is a new character and an old school friend of Mia’s. I really enjoyed getting to know her better and see what Little Pondale has in store for her and it didn’t disappoint. Whilst a book in the Little Pondale series, it easily reads as a stand alone as Breanna gets to know the rest of the residents better. 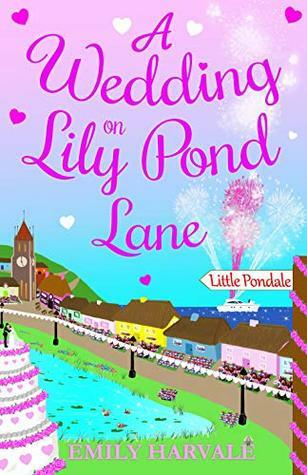 A Wedding On Lily Pond Lane is a heartwarming and idyllic read. I’ve loved seeing Mia and the rest of the residents and new comers evolve through out the series. Full to the brim with friendship, love and romance, this truly is a fabulous reading experience. I had loved every story in this series and this one is just as great! It is written so you can read it as a standalone but I have to say that reconnecting with the great characters from Little Pondale is always a heartwarming experience. This story is, obviously, about the planned wedding of Mia and Jet which is scheduled for just three months time. During her first excursion to London to look for her wedding dress, Mia encounters her childhood friend, Breanna Wright - who friends call Bree - wh I had loved every story in this series and this one is just as great! It is written so you can read it as a standalone but I have to say that reconnecting with the great characters from Little Pondale is always a heartwarming experience. This story is, obviously, about the planned wedding of Mia and Jet which is scheduled for just three months time. During her first excursion to London to look for her wedding dress, Mia encounters her childhood friend, Breanna Wright - who friends call Bree - who always aimed to run her own wedding planner business, The Wright Wedding. This fateful encounter leads to not one but two new romances in Little Pondale and so many laugh out loud moments you'll be left with a happy smile on your face when you finish reading this delightful story. There are misunderstandings, wrong assumptions, conspiracies and surprises galore in this finale to Mia and Jet's story. I just have to hope that it really won't be the finale to the series, though, as I really enjoy going back to Little Pondale and catching up on the villagers . . . . and I want to know more about the expected twins, too! From what I’ve heard this is the last instalment in the Lily Pond Lane series. I have read all the books in the series, with the previous one only last week, so I just knew I had to read this one to complete the story. It seems such a long time ago when we met Mia, heading to the village of Little Pondale, following the death of her Great-Aunt Matilda. By reading the other books in the series, I’ve become so involved with Mia’s life and have experienced all her ups and downs with her. The author From what I’ve heard this is the last instalment in the Lily Pond Lane series. I have read all the books in the series, with the previous one only last week, so I just knew I had to read this one to complete the story. It seems such a long time ago when we met Mia, heading to the village of Little Pondale, following the death of her Great-Aunt Matilda. By reading the other books in the series, I’ve become so involved with Mia’s life and have experienced all her ups and downs with her. The author has definitely saved the best book until last, and if this is the last story on Lily Pond Lane I will be genuinely upset at this!! In this book, we arrive at Lily Pond Lane straight from the previous book. Mia and Jet are planning their wedding which is happening in just three months’ time. Bumping into old friend, Breanna, Mia asks her to be her wedding planner to help her get everything ready in such a short space of time. All the old familiar characters are there, with the addition of some new ones such as Breanna, and it’s like being welcomed back into the family fold. Breanna’s character was very likeable and her story was lovely and I was really hoping that everything worked out for her, both in her business and her personal life! While all of the characters we have come to know and love on Lily Pond Lane are back, this book largely centres around a newcomer to the story, Bree, and old school friend of Mia and Ella, who has a vital role to play in Mi The moment the series has been building up to, the big day for Mia and Jet, is finally drawing near but will the wedding preparations run smoothly or are there still a few more bumps in the road before they get their happy ever after? You’ll have to read this book to find out! When we think everything is finished in this series, Emily Harvale gives us an extra, exciting and fun book. And you guys know I love this picturesque small town, so of course I couldn't wait to be a part of this wedding journey. Since this is part of a series, I won't give any specifics but let me just say that I still love all the funny and friendly characters that we met in previous books and I loved how the author gave us a little more of information about them and that's always fun. Then, as When we think everything is finished in this series, Emily Harvale gives us an extra, exciting and fun book. And you guys know I love this picturesque small town, so of course I couldn't wait to be a part of this wedding journey. Since this is part of a series, I won't give any specifics but let me just say that I still love all the funny and friendly characters that we met in previous books and I loved how the author gave us a little more of information about them and that's always fun. Then, as if that wasn't enough we get a wedding and all it entails. So of course it's funny, dramatic, romantic and exciting. We also are introduced to new characters that give some new flavor to the story and lot's of romance, because of course this small town has to have romances or it wouldn't be the fluffy novel we all know and love. It all made the book a perfect addition to the series, because of all the added information and journey it take us in. What a glorious feel-good read - and the perfect ending to a wonderfully happy series! As Mia and Jet begin to plan their wedding, they realise they need help. Shopping for 'the' dress in London, Mia finds her old school friend Breanna and remembers that she always talked about setting up her own wedding planning business so immediately hires her to deal with all the details which she finds overwhelming. With a newcomer to the village, Little Pondale's residents all make an appearance in this nov What a glorious feel-good read - and the perfect ending to a wonderfully happy series! As Mia and Jet begin to plan their wedding, they realise they need help. Shopping for 'the' dress in London, Mia finds her old school friend Breanna and remembers that she always talked about setting up her own wedding planning business so immediately hires her to deal with all the details which she finds overwhelming. With a newcomer to the village, Little Pondale's residents all make an appearance in this novel - some more than others! This proved to be a great episode in Mia and Jet's story and I thoroughly enjoyed it. I really admire how Emily introduces new characters into her stories and in A Wedding on Lily Pond Lane, we met Breanna. She turned out to be a well drawn and believable character with some human flaws but a great heart. She fitted in just right! This was always going to be an uplifting and warm read. It felt as though it sped by as all the characters came together and new romances bloomed. Escapist? Yes. Roman This proved to be a great episode in Mia and Jet's story and I thoroughly enjoyed it. I really admire how Emily introduces new characters into her stories and in A Wedding on Lily Pond Lane, we met Breanna. She turned out to be a well drawn and believable character with some human flaws but a great heart. She fitted in just right! This was always going to be an uplifting and warm read. It felt as though it sped by as all the characters came together and new romances bloomed. Escapist? Yes. Romantic? Yes. Comfort reading? Yes. It has been a great series and I am just hoping that Emily will return there someday soon. In short: Romance blooms ever in Little Pondale. Thanks to the author for a copy of the book. When I saw there was a new Lily Pond Lane book, I scooped it up right away. I couldn’t wait to spend time with Mia, Jet, Ella and the rest of the Lily Pond gang. This latest book didn’t disappoint. From the very beginning, I was completely absorbed in the wedding planning, the character interactions and the story line. This is an easy, heartwarming read - like comfort food for the heart. Emily Harvale creates charming, quirky characters who grab my attention and keep me interested throughout the When I saw there was a new Lily Pond Lane book, I scooped it up right away. I couldn’t wait to spend time with Mia, Jet, Ella and the rest of the Lily Pond gang. This latest book didn’t disappoint. From the very beginning, I was completely absorbed in the wedding planning, the character interactions and the story line. This is an easy, heartwarming read - like comfort food for the heart. This is the last book in the series! NOOOOO. I came into this series a bit late but will definately be going back to read the first books as soon as possible, did read perfectly fine as a standalone though. Short, snappy and packed with a lot of love, friendship and celebration. Heart warming. Uplifting. Parts had me laughing out loud. The perfect ending to this series. Brilliantly written, an easy read. All the characters feel like friends and family, the town is cute and welcoming. I absolutely This is the last book in the series! NOOOOO. I came into this series a bit late but will definately be going back to read the first books as soon as possible, did read perfectly fine as a standalone though. Short, snappy and packed with a lot of love, friendship and celebration. Heart warming. Uplifting. Parts had me laughing out loud. I have read everyone of the Lily Pond books! Absolutely loved them! Read a couple of them twice! Followed Mia and Ella and Garrick all the way! Loved hearing about their finding the story behind Mias aunt and what she left to her niece! Will be reading more of Emily Harvales books! Well she did it again!! Beautifully written, funny, emotional and heartfelt. The love you have for these characters is all down to Emily's gift of writing characters that you want to be best friends with. Can't wait for the next and hopefully not last book. I really hope there’s more to this series, I want to know what happens next for everyone. I’d love to live in Little Pondale, everyone is so friendly and helpful! I have loved this series so much, all the characters and how their lives have panned out. Absolutely loved the next instalment of Mia and friends. If you haven’t read any of them, highly recommend them all!!! Emily has a way of writing that really draws you in. Another fabulous book from this wonderful series. As always filled with lots of fun and some surprises! I enjoyed the new character of Bree, and was interested to see how things were resolved with Garrick. Recently I have binge read all of the books in the Lily Pond series, and I know I’m going to miss this place until the next book is written and published! A heart warming read. I've loved the whole series. The story just draws you in and you feel a part of the village. It did make me feel emotional and I love a wedding. I hope there will be more. I absolutely adore this series of books and this one is no exception. If you haven’t read them yet then what are you waiting for. I thought that the book was really good and I really enjoyed getting to know the different characters and I lobed how they all gelled together really well. I loved the flow of the story and it was very easy to get lost n the plot and I found myself completley immersed in the book,I started and finished it in the same afternoon - it was a complete delight to read! This is the firts book that I have read from this series (although I do plan to rectify that) so I can honestly saythat this reads fine as a stand alone!